The taproom opened to the public yesterday, July 9, and is located just off to the side of the brewery. New York State recent made it legal for breweries to have taprooms on the premises. Now the pathway from brewery to pint glass doesn’t have to be more than a few feet. Recent changes to New York State law made it legal for breweries to have taprooms on the premises, and Greenpoint Beer Works, the home of Heartland Brewery and KelSo, is the newest facility to invite imbibers inside. The taproom opened to the public yesterday, July 9, and is located just off to the side of the brewery at 529 Waverly Avenue. The six beers on tap represent both KelSo and Heartland with selections ranging from an imperial saison, nut brown lager and an array of IPAs. 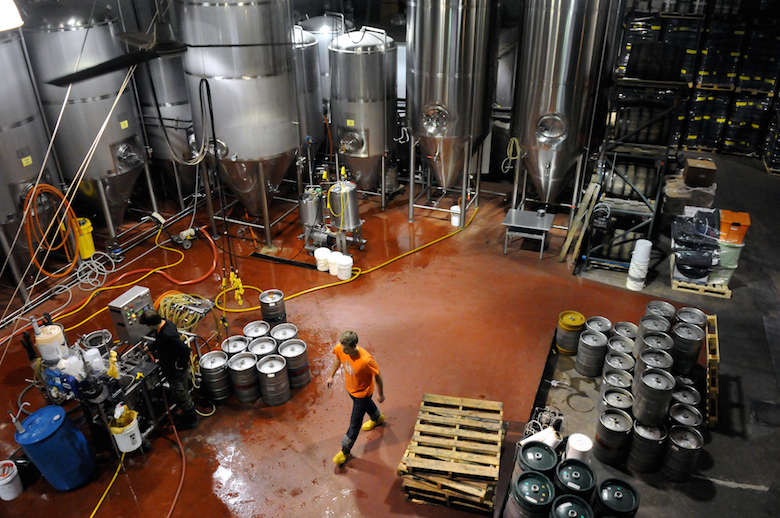 All of Heartland’s beers are brewed, fermented and conditioned at the brewery so customers are absolutely taking a peek behind the scenes of every sip. Fully open to the brewery, the taproom makes it delightfully impossible to forget that you’re inside an industrial space. Heartland is the second largest brewery in New York City and brewmaster Kelly Taylor says that they’ve been “missing out” but not having a taproom until now. “A lot of other breweries have a place where you can go and taste,” he explains. Finally, this will be one of them. Those who may have been sad when Heartland stopped selling growlers can breathe easy: they will be selling them again. The new law also requires that taprooms have food or snacks on the premises so expect to find chips, pretzels and other goodies.